2010 was a busy year for Edward Douglas and Gavin Goszka. Not only was their film The Dead Matter released that year, but they had also teamed up with Destini Beard for her album The Dark Masquerade and released The Dead Matter: Original Motion Picture Soundtrack. They also released their thirteenth album: Halloween Music Collection. Said album consists of material specially selected from the following albums: Realm of Shadows, Gates of Delirium, Vampyre, Dungeons and Dragons, The 13th Hour, Out of the Darkness (Retrospective: 1994-1999) and The Dead Matter: Cemetery Gates. It’s worth noting how Out of the Darkness (Retrospective: 1994-1999) contains rerecorded and remixed versions from early Midnight Syndicate releases, so the selection of music is even larger than expected! As I have already commented on certain selections picked for this album, I decided to include those comments along with my new material. It just seemed more appropriate that way. “Family Secrets” starts with a synthesizer riff that should be familiar to horror movie fans, then gives way to a light, steady piano under synth and wordless female vocals. A bell causes a shift to greater sense of danger, then shifts out to interesting variations in both music and vocals. “Darkness Descends” originally appeared on Born of the Night and while I feel the version presented here isn’t quite as dark in feel as the original, it is still scary. The opening piano leads to bells and eerie backing synth work. The light use of wind and wordless female vocals make it appropriate for just about any spooky scene. The same goes for “Fallen Grandeur,” a great “general scare” track thanks to its spooky, speedy organ work followed by heavy synth and the occasional chanting vocals. Moans take us into “Room 47,” where wordless male vocals and “Darkness Descends”-style notes help further chill you. Wordless female vocals join in, along with all-new piano work comes in later. The ghosts remain a constant presence and therefore this track is ideal for séances and any other scenes involving one or more ghosts. The new “Born of the Night” may lack the whispering vocals at beginning, but still has the great piano work and heavy backing notes I adore. I consider it one of my favorites no matter what form it is available in. It’s just so moody and evocative! The wordless female vocals and piano speedup (with some light touches) play a huge part in creating that feel. A spooky buildup and horror movie-style musical stinger welcome us into “Raven’s Hollow.” This soundscape combines wind, distant tolling bells and ravens cawing to make a track perfect for a haunted forest or graveyard. Unsure synths, soft wordless vocals and knocking tones create a perfect slow buildup to “Awakening,” which was a Hammer horror tribute years before Monsters of Legend came to be. In true classic horror movie style, crashing gongs usher in a change in tone so it feels more confident and regal. The unisex vocals and bells also add to the overall mood. “Shadows” still has soft pounding notes at opening, but sounds different. There are light music box-like touches and the buildup isn’t as intense, but it has spookier feel this time around. It still has all the great piano work, sound effects, vocals, etc. that made it so special as well. This track is actually a reworking of a track from the band’s self-titled debut album called “Darkfolk,” which had more of a fairy tale feel to it. Similarly, “Haunted Nursery” has its origins in a track from that album called “Enchanted Nursery” and was one of the earliest tracks ever written for the band. The most recent version skips the opening sound effects and goes right for the creepy music box that slowly winds down. So if you plan on using this in a haunted nursery, the track’s ending is a great cue for a hidden helper to do their thing. This works especially well if you have a decoy prop set up to make your visitors think is going to be the thing that scares them. Given its tabletop RPG origins, “Army of the Dead” was apparently designed for the introduction of monsters in play. This is why the dramatic, steady synths are coupled with the sound of burning torches and footsteps. The chanting vocals, drums, gongs and tones that make me think of horns and strings all conjure up a feeling of menace. If you play it low enough, you can eliminate the sound effects but still retain the music. No matter how you chose to play it, I think it would be great for a scene involving a cult or summoning ritual. Or if your haunt’s story involves a location with multiple secret tunnels, having this play behind a wall can imply beings marching somewhere out of view. A medium, steady piano opening in “Dark Legacy” leads to synthesizer work, and later a gongs signals the organ to join in. It feels like someone recollecting of the past, and there are otherworldly touches at one point (along with vocals). The synth work in “Morbid Fascination” reminds me of main titles to John Carpenter’s The Thing. I love the piano buildup (and variations in play) which follow and how it contrasts with the synth work. The wordless female vocals and storm effects add to the overall sense of mystery and lurking. This has plenty of uses, but if you want to use in room based on The Thing, I say go for it. The short, but scary “Deadly Intentions” uses a whispered female “come with me” and synth work to great effect. Such vocals and synthesizer work lead us into “Undead Hunters,” which has a very dramatic tone. I love the use of gongs, wordless unisex vocals and bursts of drums. You can feel the danger and pursuit in this. “Soliloquy” still features a mournful piano and wordless female vocals, but is a little louder and more “confident” in its new version. The piano seems to be slightly faster here, bit you can still feel the sorrow and loss. Although the wordless male vocals are still present later in the track, the bells don’t show up until much later. I suggest using this with a “Beloved” tombstone or with a bleeding portrait modified to produce tears of blood. Eerie instruments and wailing wind offer an effective opening in “Tempest.” It’s mostly a storm soundscape, but there are some unisex vocals layered into the mix as well. It works wonders in so many kinds of scenes, even a simple spooky room with a hidden fan blowing at guests. Running just under two minutes, “Grisly Reminder” effectively uses soft, light synth work and piano with the occasional use other effects. “Residents Past” offers wailing choral vocals and slow piano coupled with cymbals. The use of synth work and tolling bells help make me think of people from long ago. Maybe this could be used in a room where a Pepper’s Ghost effect is used to make spectres of the past appear? The piano work in “Veiled Hunter” is medium in both volume and speed, and also picks up synth at times. In fact, sometimes it reminded me of the famous “ki ki ki, ma ma ma” from the original Friday the 13th. Castle setups will benefit from use of “Alchemist’s Chamber,” which uses heavy, somewhat pounding synth over very scary organ work and wordless vocals. Harpsichord interludes gives it an “ancient” feel. “Noctem Aeternus” (which means “The Eternal night”) sounds very close to the original version. The brief, slow piano note and male vocals still open it and there’s plenty of synth work. In fact, the only major difference I picked up was how it seemed a little darker in tone and the wordless female vocals seem to have some new touches. In “Vampyre,” winds take us into wordless female vocals. Said vocals burst into a full-fleged chorus singing in Latin after a gong strikes. These are all a constant in the track and are joined by organ music, dark synth tones, wordless male vocals and tolling bells. The synth work takes on menacing quality and the gongs help one feel like they are being chased. As you have guessed from the title, any vampire scene in a haunted house would benefit from having this played in it. 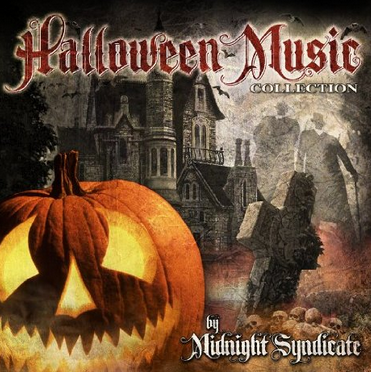 As a “best of” album, Halloween Music Collection is the perfect starting point for new fans or for those who have yet to collect the entire Midnight Syndicate discography. But even if you already own the albums it is derived from, it’s still worth having as a handy collection of classic tracks from the band’s past. It would be great played in a loop on Halloween and most of the tracks lend themselves well to individual looping. The music can be potentially used in an untold number of haunted attraction scenes rather than fitting only a few select room types. Not only is it available by itself, but you can also get both it and The Dead Matter: Original Motion Picture Soundtrack when you buy the special edition The Dead Matter DVD pack. And you had better believe that last detail is going to come into play here at some time in the future. Special thanks to Linfaldia Records for the review copy!